First, in a skillet over medium-high heat brown one pound of ground beef and use your spatula to break the ground beef up into smaller pieces. Now season the ground beef by adding the seasonings that make up the homemade Keto taco seasoning; cumin, chili powder, onion powder, garlic powder, salt, and pepper. And stir to make sure everything is well combined. Once the ground beef is browned remove from the heat and set aside. I prefer to let the meat cool before adding it to my taco salad because hot ground beef on a bed of lettuce is kind of soggy and weird. In the meantime, prepare your desired low carb taco salad toppings. Cut up cherry tomatoes, slice an avocado, shred some cheddar cheese, etc. More ideas for low carb toppings for taco salad below! For any Keto ground beef recipes, I recommend Organic Grass-Fed Ground Beef. I get mine from Trader Joe’s for only $6 per pound. 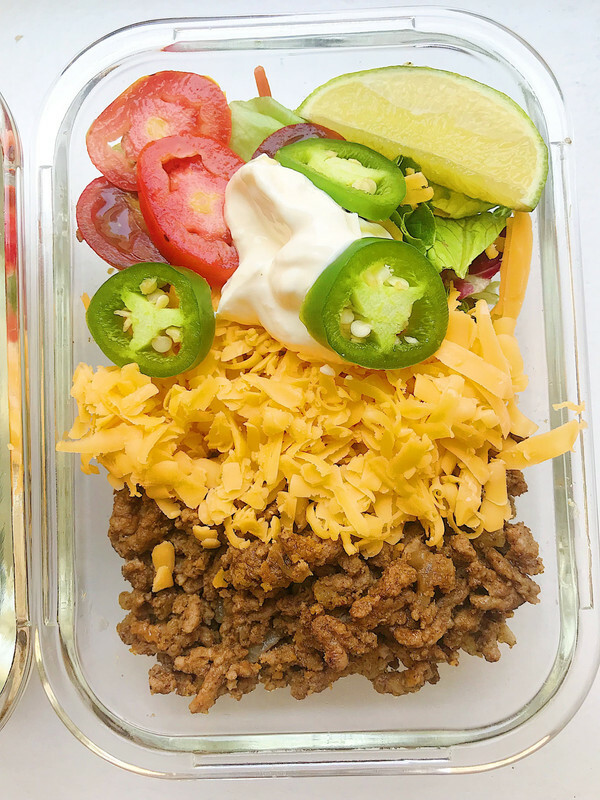 I know it’s a little more expensive than regular ground beef, but this Keto Taco Salad Recipe will make at least 4-5 taco salad lunches out of just one pound of ground beef. 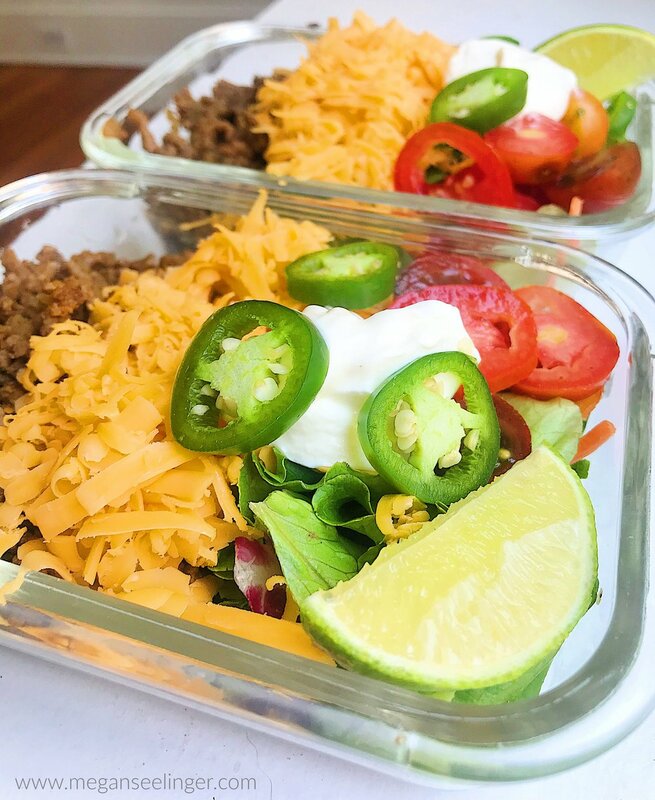 So if you break it down, that’s only $1.20 per each Keto taco salad, which isn’t bad at all for the peace of mind that you’ll be having a much healthier lunch every day. Here’s the deal… conventional beef cattle eat grain-based feeds, usually containing corn or soy and are given antibiotics and growth hormones, which means if they eat that, then you eat them, you’re consuming the grains, antibiotics and growth hormones too … yuck! Check out my Full Guide to Shopping Organic so you can learn what foods you do and don’t need to worry about buying organic. Plus 5 Ways To Shop Organic On A Budget. You can really add whatever taco toppings you’d prefer, however, to keep it Keto I’d stay away from corn and go easy on the black beans if you decide to add those. Side note: I recommend buying a block of cheddar cheese and shredding it yourself. When you buy pre-shredded cheese, it contains unnecessary ingredients that prevent it from clumping together. You could also get creative and try making a Keto Taco Shells Recipe. PRO TIP: When you make any Keto meal prep lunches you want to be sure you’re using BPA free plastic that's free of toxins. Here’s an article by healthline that goes into the full details on What is BPA and the health concerns. I have a huge stack of these Fitpacker Containers that make meal prepping much easier, microwavable, dishwasher safe, sure lock seal, and my favorite part is how nicely they stack together, so my Tupperware cabinet doesn’t look like a tornado blew through it! They are pretty inexpensive too, so you won’t be as mad when your husband leaves them at work. Low Carb Taco Salad Or No Carb Taco Salad? 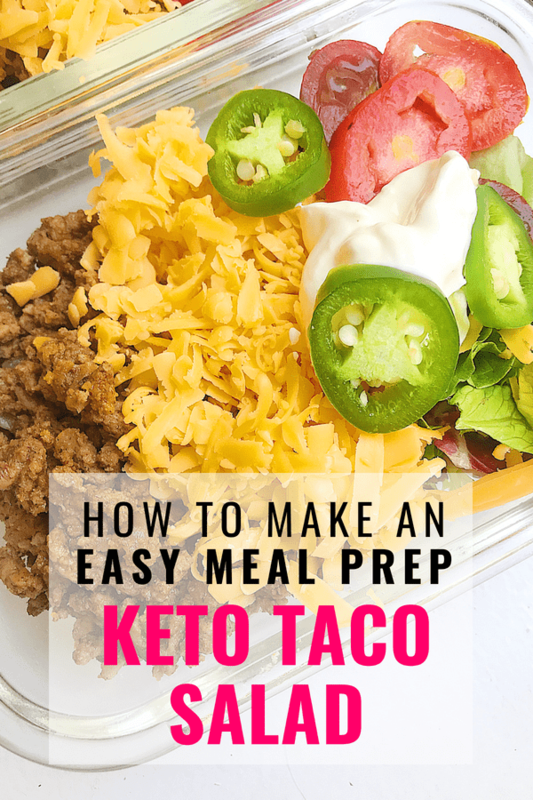 You could get away with a no carb taco salad if you only add sour cream to your Keto taco seasoned meat, but once you start adding on extra toppings, you will begin to add carbs. If you stick to a few of the low carb toppings, I listed above you will still have a delicious low carb taco salad. 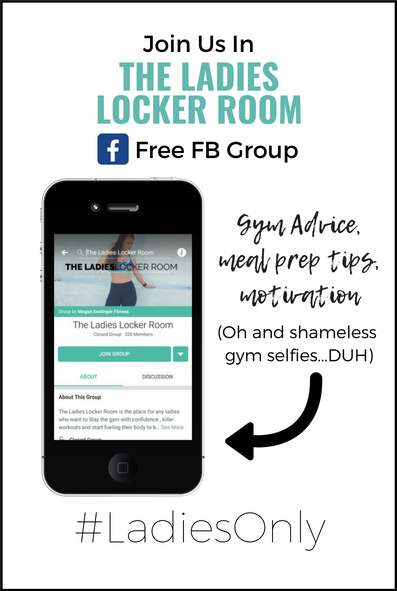 The nutrition facts are based on 1 cup of shredded lettuce, 1 oz shredded cheddar, 1 tablespoon sour cream, and 3 oz of the ground beef mixture. 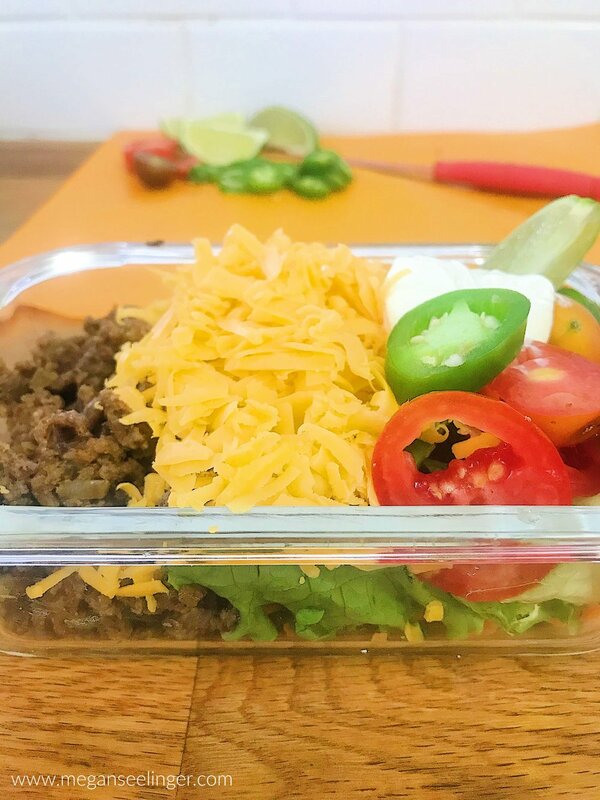 This way you can easily customize you Keto Taco Salad with your favorite add-on taco toppings. Add cumin, chili powder, garlic powder, onion powder, salt, and pepper. Stir around to fully combine. In 5 separate meal prep containers portion out 1 cup of shredded lettuce, 1 oz shredded cheddar, 1 tablespoon sour cream, and 3 oz of the ground beef mixture once it has completely cooled. <-- this is what the nutrition facts are based on. add whatever other taco toppings you prefer from the list of optional Low Carb Keto Taco Salad Toppings.